Thelma Mae Taylor, 105 of Radnor, went to be with the Lord Tuesday morning January 29, 2019 at the Ashley Manor, where she had been residing for the last 11 years. Thelma was a homemaker, wife, mother, grandmother, great grandmother, great great grandmother and sister. She was a wonderful bread baker and pie maker. 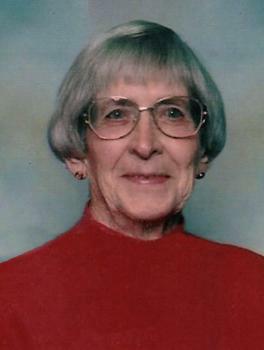 Thelma was the last charter member of the Fulton Creek Evangelical Friends Church, where she had been a very active member over the years. Many early mornings and late evenings you could find her in beloved garden. Her family and farm life were her loves. 11 grandchildren, 21 great grandchildren and 18 great great grandchildren. Thelma was the last in her family of her generation. Funeral services will be held Saturday February 2, 2019 at 12:00 noon at the Fulton Creek Friends Church, Pastor Dennis Peters and Dr. Wayne Evans will officiate, burial will follow in the Claibourne Cemetery, Friends may call two hours prior to the service at the church. I am very grateful to have a lifetime of childhood memories spent with Grandma and Grandpa at their place. Being with them taught me the importance of family, and as I've aged I realize how special our family is. Their home was a place that brought many people together. Thank you and rest in peace Grandma. Pat and Family - So sorry for your loss. As you grieve, know that Susie and I will also miss your brother and mother. Good memories abound. Stay strong. Pat, Sherry, and Linda: My condolences to you on the loss of your Mother. She will be missed. I do remember her fondly as the Fulton Creek church lady. She raised a great group of kids, and I'm sure she was proud of each of you. Rest in peace Mrs. Taylor. Many years ago when my mother, Dorothy Taylor Householder, had moved to Tennessee to live near us, she and I made an annual summer visit to central Ohio to see family and friends. One of our regular stops was to visit Thelma and Thomas. They were so glad to see my mother each time we came to visit, and we enjoyed catching up on all the family news. And their home always smelled of fresh baked goodies which they generously shared with us. Thelma was a very nice lady. Jesus as He is the answer to everything. A lifetime of knowing this gentle soul, one of Fulton Creek Friends church's founding members, she always had a smile , and unconditional love for all she met! We have missed her during her long residence in nursing care facility! She is finally back home with her love Thomas !